I could so use this today. If only I could float like a leaf, with my ears submerged shutting out all of the noise. Float all my worries away. Fall...it's in the air today. Beautiful out on this first day of September! This screams (in a calm way) serenity. I love the feel of this and could see it hanging on the walls of a spa. So beautiful! Love this image! Lovely image! I hope your day improves. I'm sure I commented on this before but I'm not above so will just say again..... You have to be as light as a feather to float on this and I'm afraid I don't qualify! I can't have pressed 'post comment'! Gorgeous. 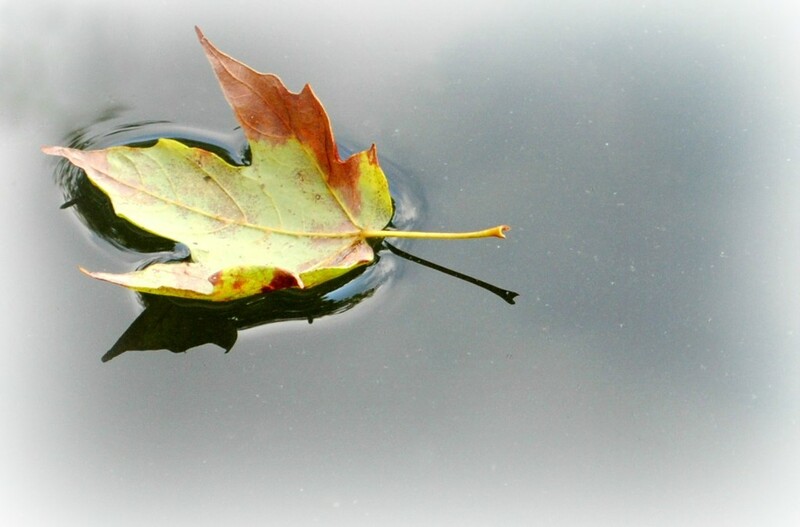 Love how the leaf is so defined from the water. Beautiful shot Amanda, weather's definitely on the turn here! Fantastic shot, Amanda! Even shows the surface tension "giving way" at the edges. Gorgeous! Great to know that fall is imminent! Favorite season growing up in southern Michigan! Fab surface tension capture. Fav. Woot Woot! On the TT!! This is wonderful! Love the ripples around the leaf!